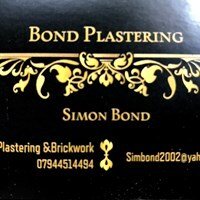 Bond Plastering and Brickwork - Builder, Plasterer based in Isleworth, Middlesex. We are a family run business with quality Trades People - we have women plasterers as well as male plasterers that have been with us for over 30 years. We pride ourselves on a friendly service and specialise in domestic plastering as well as site work to a very high standard - all domestic work is carried out with clean dustsheets and attention to every detail. I the ówner of Bond Plastering & Brickwork learned my craft in Cornwall, moving to London in 1985. I have also worked in Germany, Holland and the USA, returning to London.